HP Mobile Calculating Lab (MCL) bring classroom math and science experiments to life. First announced in Europe and now ready for pre-order in the United States, the solutions enable students to better connect mathematical formulas to everyday physical phenomena by easily collecting and analyzing real-world data in real time. HP MCL solutions are targeted for middle and high school math and science students, HP McL solutions are composed of an HP 39gs or 40gs Graphing Calculator, the HP StreamSmart 400, a variety of Fourier scientific sensors and probes, as well as calculator presentation software and classroom instruction materials. Data isolation directly done on HP 39 / 40gs Graphing Calculators for analysis. Fast data collection - up to 5,700 samples per second. Interactive, real-time data capture - students can pan, zoom in and capture datasets as they happen. What is the HP Mobile Calculating Lab? It is a solution designed specifically for math and science classrooms. Allows you to visualize experimental results immediately by streaming data in real time from a variety of real-world probes and sensors. Save time by minimizing experimental setup - just plug it in and go. Empower math students with physical experiences of mathematical models and science students with discovery of the physical laws that govern matter. How is HP McL Solution better? This reliable calculator solution covers a wide range of experiment types. Requires virtually no setup and lets students truly experiment and collect data with ease. Instead of connecting the probes to a computer or laptop, teachers and students can now view the results on a portable calculator and take their experiments out of the classroom. Do I need a laptop or computer to see the experiment results? No, you will be able to view the results on an HP 39gs or HP 40gs graphing calculator. The probes will connect to the HP StreamSmart 400 which then connects to an HP 39gs or HP 40gs graphing calculator for results. Which HP Calculator do I need? You will need either the HP 39gs or HP 40gs graphing calculator. What if I already have an HP 39gs/40gs calculator? If you already have an HP 39gs/40gs graphing calculator, you will not need to purchase another one, but simply update the HP 30gs unit (or update the HP 40gs unit). You can purchase the HP StreamSmart 400 and the Probes separately. Where do I find the classroom activities? 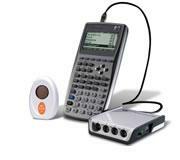 You will only need an HP 39gs/40gs graphing calculator, HP StreamSmart 400, and Fourier probes for the McL experiments. Middle and high school students, but universities and professionals can utilize the technology. Why would teachers and students want HP MCL solutions? Mobility, ease of use, affordability, greater analysis time. Why is HP MCL Solution better than our competitors? Higher/greater (student) analysis time, less (teacher) set up time. Why select HP MCL Solution? Is StreamSmart 410 only compatible with Fourier probes? Yes, currently the StreamSmart 410 is only compatible with Fourier probes.